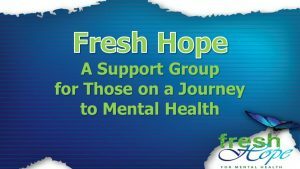 Fresh Hope for Mental Health® is an international network of Christian peer-to-peer mental health support groups whose mission is to empower those with mental health challenges, along with their loved ones, to live full and rich lives in spite of having a mental health diagnosis. Fresh Hope groups approach mental health recovery from a hope and faith-filled perspective. It is a mutual-help, peer-to-peer support group in which members encourage one another as equals under the guidance of a certified facilitator. The meeting format includes both a large and small group experience, where members can share as little or as much of their “journey” as they desire. A Fresh Hope group will begin meeting at Calvary on Sunday nights at 7 o’clock, beginning on Feburary 11, 2018. For more information, please call 336/786-4778 or email office@calvarybcmtairy.org.